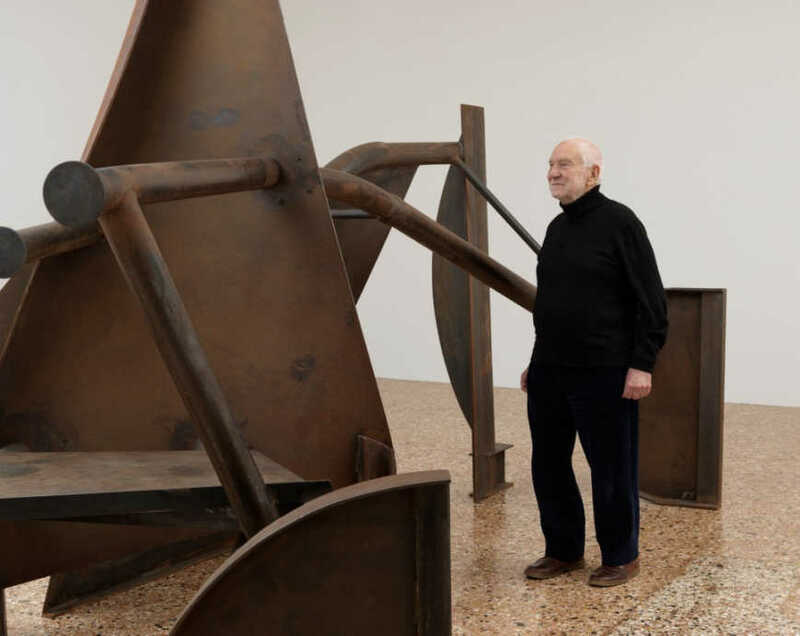 Sir Anthony Caro (b1924) is one of the world’s greatest living sculptors. He was educated at Charterhouse School and Christ’s College, Cambridge, earning a degree in engineering. In 1946, after time in the Royal Navy, he studied sculpture at the Regent Street Polytechnic before pursuing further studies at the Royal Academy Schools from 1947 until 1952. In the 1950s, he moved to Much Hadham, Hertfordshire and worked as an assistant to Henry Moore. He first achieved widespread recognition in the early 1960s. He abandoned his earlier, figurative way of working which involved modelling in clay and casting in bronze, and began to make purely abstract works: sculpture constructed and welded in steel, comprising beams, girders and other found elements painted in bright colours. Such works caused a sensation, provoking a response from some critics that these constructions were not sculpture at all. He came to public attention with a pioneering solo exhibition at the Whitechapel Gallery in 1963, which established his pivotal role in the development of twentieth century sculpture. Major exhibitions include retrospectives at the Museum of Modern Art, New York (1975), the Trajan Markets, Rome (1992), the Museum of Contemporary Art, Tokyo (1995), Tate Britain, London (2005), and three museums in Pas-de-Calais, France (2008), to accompany the opening of his Chapel of Light at Bourbourg. He has been awarded many prizes, including the Praemium Imperiale for Sculpture in Tokyo in 1992 and the Lifetime Achievement Award for Sculpture in 1997.